Improving the job prospects of young people improves the future of society. Initiatives that offer training and counseling can help address the youth unemployment problem. 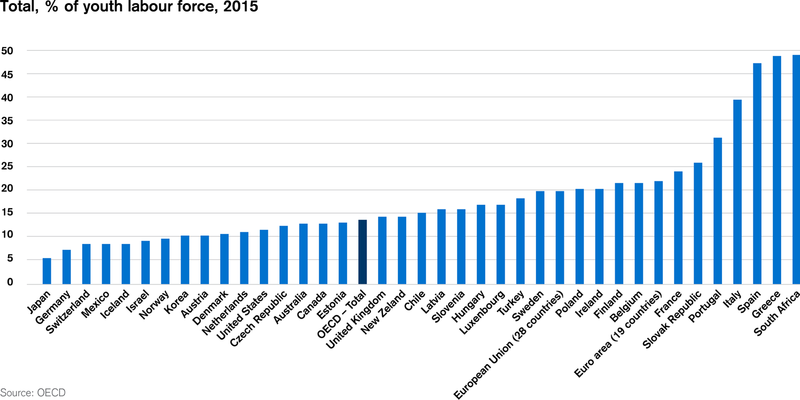 The youth unemployment rate among all 15-24 year-olds in OECD countries in 2015 was 13.9 percent. In several countries, the numbers were truly daunting: 49.8 percent in Greece, 48.4 percent in Spain, and 40.3 percent in Italy. In Switzerland the number was 8.6 percent. Landscape format recommended for smartphone users. Starting a career sets the course for the future. Thousands of young adults are unable to find a first job after completing an apprenticeship or obtaining a degree. The situation is at least as difficult for young people who have not yet obtained training. The longer they stay unemployed, the greater the danger of permanent exclusion from their chosen profession, if not the workforce. This has long-term damaging consequences for society. Tackling this challenge has become imperative. A variety of initiatives taken show that the problem can be ameliorated, improving the situation for individual young people and for society at large. With youth unemployment in Switzerland climbing in 2009, Credit Suisse launched an initiative to tackle the issue. The Youth Unemployment Initiative invested close to 30 million Swiss francs in the projects of six partner organizations aimed at improving the job prospects of young people. From the start of the initiative in April 2010 to the end of March 2015, over 8,800 young adults received support in the form of training and individual counseling. Over half of them subsequently secured employment, and over 1,000 of them embarked on training. Intégration Pour Tous/jeunes@work. This three-month series of courses, individual coaching, and work placement in French-speaking Switzerland prepares apprentices and other secondary school leavers for their entry into the job market. Fondazione youLabor/Career Start-up. During a four-month period, graduates of apprenticeships and colleges in Ticino canton receive help in entering the job market with courses, individual coaching, and strategic searches for a specific position. Network LBV. The vocational certificate associations Lernwerk (AG), overall (BS), fripab (FR), Bildungsnetz (ZG), Berufslehr-Verbund Zürich (ZH), and Chance (ZH) have joined forces to create a network to raise businesses’ awareness of the skills of vocational certificate holders and help the young people with such certificates find employment. SLA Regional Associations/CT2. The CT2 program and several SLA Regional Associations help young adults get started in the working world by providing job hunting support and, later, assistance with professional integration. Stiftung Pro Juventute/MyFutureJob. This professional reorientation program helps young people who do not secure continued employment on completion of initial training, can no longer continue in their chosen profession due to physical or mental health reasons, or just don't know which way to turn in their careers. Stiftung DIE CHANCE. In the Swiss cantons of Appenzell, Glarus, Grisons, St. Gallen, and Thurgau as well as the Principality of Liechtenstein, young people are provided individual support in finding an apprenticeship and coaching during the apprenticeship. Find out how Credit Suisse can help you with philanthropic opportunities that tackle youth unemployment.